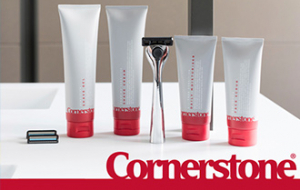 Cornerstone sells high quality men's toiletries on a flexible subscription model over the internet, so that you never run out of bathroom essentials. With over 170,000 happy members using their products every morning and countless awards to their name, this British startup has taken the men's grooming industry by storm in the last few years. Visit www.cornerstone.co.uk/rc and enter your email address. You will then be able to quickly set up your new account and enter your unique e-voucher code. E-vouchers can be redeemed against new subscriptions only (priced at £20, £25, £30) at www.cornerstone.co.uk/rc. Any unused or remaining credit will be added to your account, is valid for 12 months from purchase and may be used against individual products or towards future subscription boxes. Valid for new customers only. One per household. UK customers only.